1. Get Moving Mondays – After the weekend, people are not as excited about getting up and going on a Monday. Get Moving Mondays will provide some easy tips to help Americans get moving and keep up an active lifestyle all week long. 2. Tasty Tip Tuesdays – Many people are afraid of losing the taste when they make a recipe healthier. Every Tuesday, the Association will take a traditional recipe and teach people how to substitute certain ingredients for healthier options without losing the taste. 3. What’s Cooking Wednesdays – With Thanksgiving kicking-off the holiday season, keeping yourself on track and eating healthy is very important. Each Wednesday, the public will vote on recipes that represent a healthy side dish, appetizer and/or dessert that they would like to see for a holiday meal. At the end of the month, we will unveil those winning dishes. 4. Get Together Thursdays or Any Day! – This engagement will offer ways for INSERT CITY residents to implement healthy cooking activities into their daily lives through “Do-it-Yourself Fundraisers” called “Cook to Stop Diabetes.” These fundraisers will be fun parties that can incorporate healthy recipes for family and friends and will also raise money for the Association. 5. Fact Check Friday – Challenging the public’s knowledge about nutrition and diabetes, each Friday a question will be posted to test diabetes knowledge and encourage people to share it with their friends, family and/or co-workers. 6. Weekend Challenge to Stop Diabetes – Why not take the weekend and use it as an opportunity to get active and help raise funds to Stop Diabetes? We will provide fun fundraising activities for people to engage in and use their 48 hours to participate, or if they are too busy then do the 48 hours to donate! 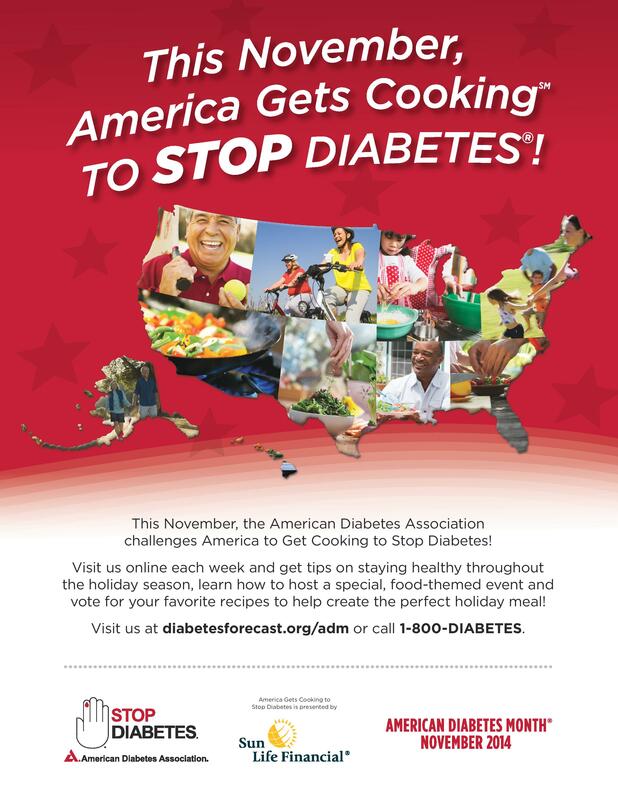 For great tips, recipes and more each week, visit the Association’s interactive web page at http://www.diabetesforecast.org/ADM.